The second playoff matchup happened a year later when the Chargers came into Foxborough looking for revenge in the AFC Championship. Instead they got handled 21-12 despite a valiant effort from Rivers, who played with a torn ACL while Tomlinson spent most of the game on the sideline buried in his big warm jacket, hiding from the world behind his obnoxiously dark visor. But that’s enough LT bashing for now. 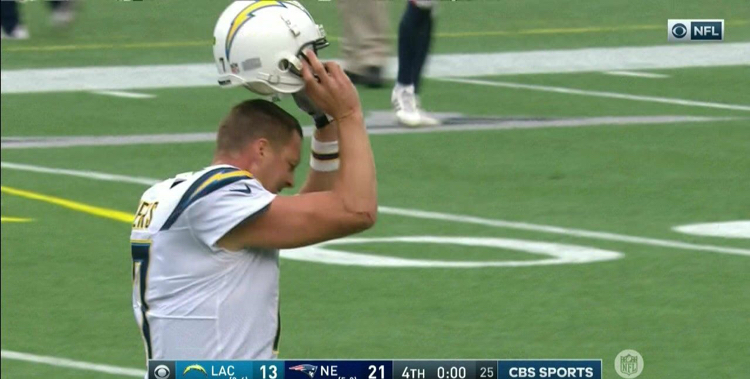 Including the regular season, Philip Rivers’ Chargers are 0-7 against Brady’s Pats dating back to 2007. Rivers’ one career win against New England came in 2008 with Matt Cassell at the helm. There’s no reason to believe that Rivers won’t be 0-8 against Brady a week from now. San Diego is undoubtedly one of the superior teams in the AFC this year, but what does that really mean? There isn’t a single team in the conference or the entire NFL that is far and away better than the rest this season, so this game will come to down to what playoff games in Foxborough usually come down to. Home field advantage and preparation. The last time the Patriots lost at Gillette Stadium was October 1st, 2017. Since then they’ve won 15 home games in a row. The Chargers are certainly worthy opponent and Rivers is a man on a mission, but Foxborough is a place where AFC quarterbacks’ missions have come crashing down annually in January for the last 18 years. Expect freezing cold temperatures and a west coast team that can’t quite handle the elements and the preparedness of the greatest coach and quarterback of all-time.